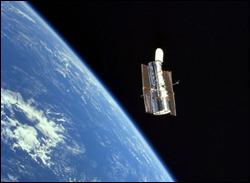 The Discovery Science Channel featured ISR-affiliated Associate Professor Dave Akin and his Space Systems Laboratory on the show Hubble and Beyond: Telescopes in Space. The neutral buoyancy tank in Akin's lab is providing the environemtn to test robots for an upcoming NASA robotic mission to repair the Hubble Space Telescope. "The Hubble Robotic Servicing Mission is a pioneering step in the use of robotics in space to preform assemblies and repair work. And this is the kind of technology that's going to be needed for space exploration. They can't test the arm in space, so they use the next best environment, an immense water tank normally used to train astronauts. Here at the University of Maryland, engineers have submerged a full-scale model of Hubble. They are making sure a prototype of the robot can maneuver large telescope components. From a control room, they use joysticks to guide it."